When you have 2 months of waiting on a permit and demo that takes three quarters of a century, you have lots of time. Time to think. Time to rethink. Time to question your thinking. Time to stalk Pinterest and find all the coolest ideas that you now MUST implement or your brain will die a slow death. There was one inspiring kitchen that started it all, though. This one from House and Home Magazine's October 2015 issue. I took a photo of the page and sent it to my contractor, hence the photo quality sucki-ness. Then, I took advantage of my contractor. I lean on the talents of the people working on the project. If they have special skills, I use them. I use them for all they are worth. Wah-ah-ah-ah. It is helpful if you already know the contractor for hire. My contractor Joe Wood of All Around Joe is a sucker for carpentry projects. I told him my idea of chunky wood shelves and he was instantly hooked. He was especially excited because he would then be "forced" to buy a planer he had been eyeing. A win-win for all. So, off to Building Value I went to pick up some old wood. I found what was probably 100 year old floor joists. I know because I ripped the same things out of this very house and had them pitched. There just wasn't room to move! People wanted it out of the way. You can't store everything. I'm not Nicole Curtis. I don't have a garage X3. I lived in a condo. You can't win everything. Anyway, found the wood. Brought it to Joe. He did his magic. A hood can be almost anything. All you have to do is build a box and throw an insert into it. So, in this project the box was just framed and drywalled. I didn't want a big shiny silver thing stealing the show. I wanted to mimic the chimney bump out in the living room but not draw much attention to the hood itself. From there, Joe attached our salvaged wood floating shelves on either side and trimmed out the "hood box" with some of the salvaged wood. In order to balance the room out, and get the coffee bar I was dreaming of (bc Pinterest and Joanna Gaines), he ripped a few more boards to span the fridge/pantry area on the neighboring wall. I didn't want to do another backsplash tile and introduce another pattern and material, so I opted for chalkboard paint. Only problem was I didn't want the chalkboard paint to just end at the top in an awkward line. So, Joe came up with the fab idea to trim out the entire coffee bar with more of the salvaged wood. I personally drew the coffee bar sign. I'm no Picasso but I think it looks decent. PRO TIP (from a pro not me): dip your chalk in water before you start writing. It makes the chalk line nice and bright. What I love (but also hate) is designing on the fly. In some cases it's really frustrating and stressful to have some things up in the air. I'd love to say that every idea is perfectly thought out, scheduled and implemented, but it's not. I usually have a pretty good idea of what the design will be. But, inevitably I end up tweaking the idea until it is something new, original and even better than I envisioned. This is also something great about Joe and his team. They are flexible. They want it to look great. They are proud of their work. I like them. Hire people like Joe. When we're not renovating houses, we're doing new designs for those who want to tackle the renovations on their own. 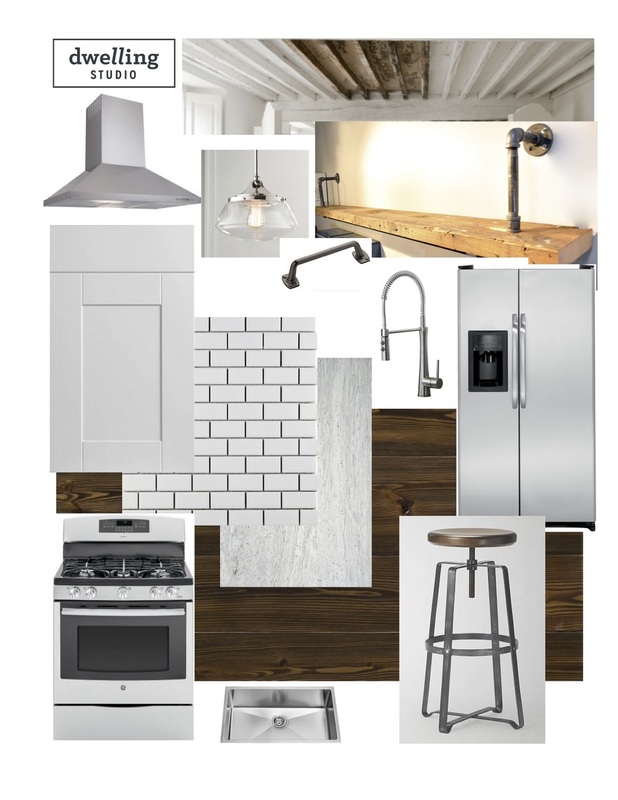 A client asked us to put together something for her dining room and kitchen. She filled out our quick questionnaire and sent us some photos. Game on! "We need to move the washer/dryer- with this, we will be re-designing the eat in space of the kitchen. We're also looking to update the kitchen cabinets and floor. We don't have an extensive budget, but we are learning to be handy. We recently moved in to this house, and there's a chance we may move again in the next 5 years. So, we're looking for something functional for our family but not too custom that could potentially hurt the resale appeal. We are hoping to paint the kitchen cabinets white and change the floor of the kitchen." When I saw this kitchen and dining area, I immediately knew what to do. Simple and clean lines of white cabinets and white backsplash would appeal to many buyers and won't be out of style within her 5 year timeline. A hint of color in the furnishings and window treatments would add a little fun without any permanency. Cabinets: Let’s start with the most important part. We recommend leaving most of the cabinets, but paint them a nice crisp white. Behr’s Ultra Pure White is a good choice. To open up the space a bit, remove the cabinets to the left of the window, eliminating the awkward and bulky cabinet that sticks out over the peninsula. Ideally, the soffit would go, too but that could be costly. It’s ok to stay as it is. Counters and Door Hardware: From your photos, it appears that you have black granite counters and stainless cabinet pulls/hinges that could remain and work with the new look. Flooring: To get the rustic look, use a tile that looks like worn wood. It will hold up well with the traffic in the kitchen and dining area. Backsplash: Tile the backsplash with a simple white subway tile. It is classic, modern and inexpensive. White grout will give it a clean, simplistic look while a dark gray grout will give it a little more interest. Carry the backsplash from the refrigerator on the right, all the way to the peninsula on the left of the sink. We recommend carrying it all the way to the soffit where the cabinets to the left of the sink used to be. Shelving: Replace the cabinets that were removed with open shelving. We like black brackets with a pine board painted white on top. If you will use the shelves for dishes, make sure it is deep enough to hold your dinner plates (10-12”). Keep the items on the shelves to a few neutral items to keep from looking cluttered. Faucet: Replace the faucet with a modern stainless goose neck version. Do she really need more storage in the kitchen? Will moving the laundry to the basement be a huge inconvenience being further from the bedrooms? Closet: If she does decide that she'd like more storage in the kitchen and move the laundry to the basement, consider installing the same wire shelving that is in the pantry. This closet could be used to house small appliances such as the stand mixer, bulky serving ware and other items not used daily. Also good for this closet would be supplies used on the dining table for homework or craft time. Dining Area: A rustic wood table with a metal base will be great for meals as well as hold up to every day use. Add some interest with colorful metal chairs and an orb pendent light fixture. The rug could be used to add softness to the room, but could be left out in case kids will be dropping lots of food on it. Windows: Bring out the bright color used in the dining chairs again in the window shades. Choose a geometric pattern that is lively for a roman shade over the kitchen sink and the same matching fabric in curtains in the dining area. Along with the design and road map, she received a spreadsheet with the locations of all the items in the mood board, quantities she'll need for her space and the total cost to purchase the items for the 2 rooms. The total came to $2210, not including any labor costs and building materials. What many of our clients do is use this as a starting point. We find middle ground priced materials at realistic costs, not best case scenarios. This way, if they find a coupon for Lowes or a similar tile at a discount store, they're going to come in under budget. Win-win!